The following review posted on SigForum and written by one of our Practical Fundamentals students who took the class in November 2010 caught our eye and we received permission to post here on our site. Thanks to SigForum contributor Tubetone for the review and pictures! There is a full gallery at the bottom of the post, and you can click on any image to see a larger size. 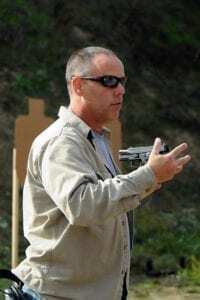 I am writing this review to describe my experience with Grayguns’ Practical Fundamentals class on November 6-7, 2010 at the Safety First Shooting Association in central California. This is my subjective experience and one person’s view of the event. If I misstate any concept here, the failure is my own. I am relating my view of what happened to me and the great value I found in this excursion. This review may have more detail and pictures than normal but I hope you find it useful. I am sure each student of past classes may have a different take but this is mine. We suffered an embarrassment of riches regarding instructors. We only had nine students but 5 instructors/adjuncts. The personal attention and interaction was simply phenomenal. It was like a Grayguns (GGI) convention. Bruce Gray, Jerry Jones, Randy Lee, Tang, and Roy Nelson were all working the line. Each of them had unique but engaging personalities. They worked extremely well as a team. I did spend some extra time with Tang on day one because we had been discussing the “Soft Eyes” concept via email for many months. As much as email is nice, there’s just nothing like being there in person. Each instructor added many things to me via personal coaching on the line, during instruction and during breaks. Each student received repeated personal attention from each instructor. I suspect our lunches and dinners together added to the easy learning environment. We learned about many issues like grip, stance, reloading, the draw, sight picture, sight alignment, and safety but the thrust of the class was TRIGGER CONTROL as GGI defines and teaches it. I have had approximately 22 other instructors this year and GGI taught differently and showed each of us how to refine so many parts of the fundamentals as we worked through the exercises. I heard more detail and nuance about every fundamental except my stance (Odds are I had to have something that was O.K.). 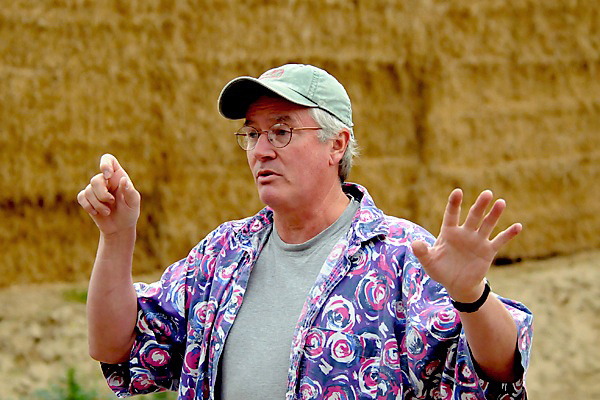 I knew I wanted to take one of Bruce Gray’s classes from the first time we spoke. 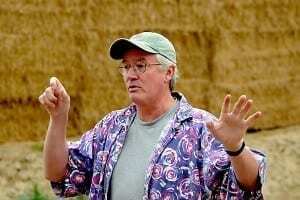 After I sent Bruce an email about a year ago, Bruce surprisingly called me on the phone and we spoke about shooting for nearly an hour and a half. I had never met any of the other GGI staff but was delighted to finally meet them and experience their inviting personalities as well. As far as GGI’s Practical Fundamentals class, I was specifically seeking something to help me improve speed and accuracy. I wanted demonstrations and also hoped for some personal understanding and use of the concept of “Soft Eyes.” I expected high level instruction and some personal improvement and was not disappointed. I received detailed instruction on trigger control, defining what is prep, why one needs to prep, when to reset and how to prep the trigger. I learned drills for future practice and improvement along with a strategy for instant self correction. I did actually have some glimpses of “Soft Eyes” during class so I finally have experienced and recognized it. I also experienced what it is to have trigger control in some rudimentary ways, leading me to moments of improved strings and results on which I can build. I was not the only one. 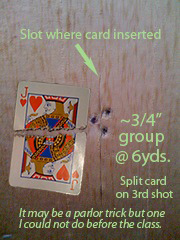 In fact, at the very end of the last exercise, each and every student in the class shot and split a playing card edgewise from 6 yards. When I say everyone, I mean each member of the class whether competition level or a person taking their first-ever pistol class. I do not know of any class that produces such a uniform result for all levels of shooters – especially since this was a trigger control, not a card splitting, class. We shot about 200 rounds the first day with lots of instruction, demonstration and slow practice to learn and reinforce the fundamental concepts taught. The instruction provided more detailed and deeper explanations with personal interaction that was simply invaluable. We shot about 690 rounds on the second day as the pace and rate of fire increased. We were paced through a logical series of deliberate skill building and concept reinforcing exercises. From my point of view, the “dare to fail” approach was necessary to try things in different ways. It was hard to trade some things that worked for new ways but the instructors invited us to “buy into” other paths that had much more growth potential. My DA shooting (normally something I like) stunk up the place as I struggled with a new way but, again, I can see the value in what I’m going to try to change. By the way, I have only one thing to say about the Humiliation Drill: YUP. Equipment: In terms of pistol evaluation, Jerry Jones tried out my P226 so I could see the splits possible with it. He shot 7 round splits of between .17 and .18 seconds. In his hands, I saw that my P226 could churn out shells like a flowing waterfall of brass arching out of the ejection port. I also learned a lot from Bruce showing me how he could get 9 levels of nuance from my shortened single action. Prior to class, I felt two nuances and now I’m up to 5. I also had three instructors suggest that I try a smaller grip because of hand fit. Thought Process: In terms of thought process, my focus has shifted from the sights, target, others, and results to TRIGGER PREP. It’s easy to say but their personal feedback helped me identify and change my thoughts. They taught me how to return to being surprised by the shot instead of willfully making it. I’m not sure if it’s a process of uncluttering thoughts or cluttering them with the right thing. Skills: Trigger Control is taught and explained in increments while discussing issues like slap, reset, recoil and getting the sights & prep to meet one another at speed. Prepping the trigger increased both speed and accuracy for me on the occasions when it all came together. I have now done it so I know what it is and know how to practice to get it to happen more often with GGI’s drills. Instruction: The teaching style was careful and detailed. The issues were not glossed or ignored in favor of ADD drills. I learned useful drills and concepts for future growth. The fact that instructors were willing and able to demonstrate the skills taught added not just to credibility but seeing things at speed in application. Overall, there was a constructive spirit for group and personal instruction. At this point, I still feel as though the second day burned a lot of ammo where things happened so fast that I reverted to old habits just to keep up. I fought the old habits but maybe that was the point. My overall evaluation is that this is a fabulous pistol course. The results by each member of our class speak for themselves. No other pistol class I know of delivers a card-cutting level result from each student regardless of each student’s pre-class skill level – all while predominantly studying a separate topic: trigger control. 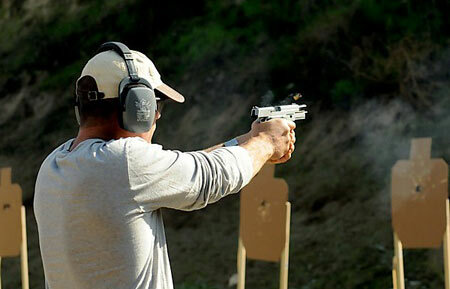 It is as if target accuracy is what naturally follows those who focus on what GGI teaches as TRIGGER CONTROL. It helped that each student and instructor left their egos somewhere far from the range. 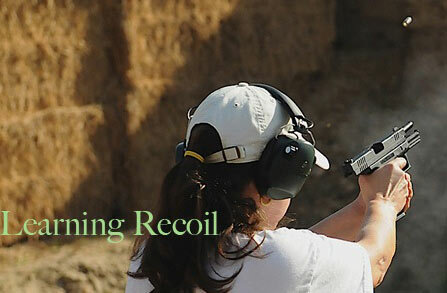 GGI created a supportive learning environment for experienced and new shooters alike. There is more than enough challenge and something to learn for each level of shooter. Many more photos were taken but these were selected for this review to try to convey a sense of the action on the “slow” day while showing how the students and instructors engaged in the Practical Fundamentals process. I overheard students at varying levels say that they would like to take this exact class again because the material covers many levels at the same time. Many of the students seemed to think that the day of few rounds, detailed explanations and focused drills was the part worth repeating over and over again. It seems to me that if I had mastered my current level, the next level was presented, explained and challenged in this same class. I, and I suspect others, only did the drills at or just above our/their own level during live fire. Seeing Bruce, Jerry, Randy and Roy demonstrate their higher level was inspiring and shows the continuum of growth that is possible. Even the instructors are not at the same level but they appear to be on the same path. As shown by the instructors and the class, GGI’s approach to Practical Fundamentals can deliver increased speed and accuracy as one progresses through deeper application of GGI’s definition of trigger control . . . . . or so this all seems to me.